Molly Bather Padded Seat Makes Transferring Easy. The Molly Bather bath lift allows you to use the whole length and depth of your existing bath. Sitting on the padded seat makes transferring across to the belt easy and safe. Simply retract the belt into the seat to return to normal bathing. Rechargeable battery operation means no mains electrics in the bathroom. To charge the battery simply flip back the seat and lift the battery out and plug into the charger. A slip mat comes as standard and helps with adjusting position as the belt lowers you into the water. 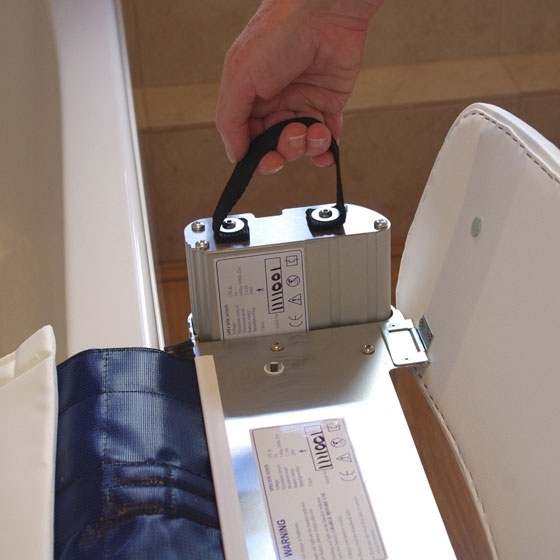 The Molly Bather is one of the most versatile belt bath lifts available. 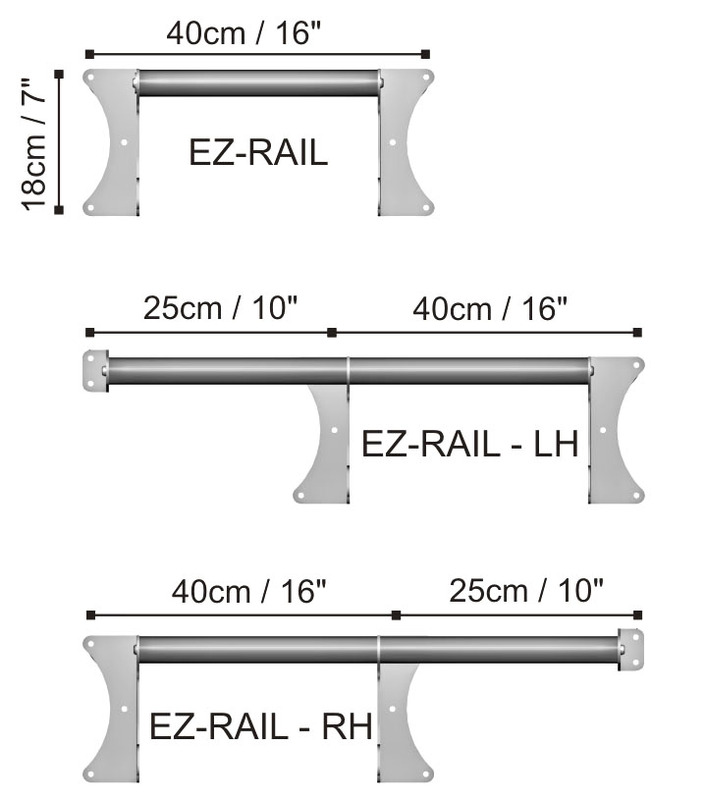 It allows you to use all of the length, width and depth of your existing bath tub. 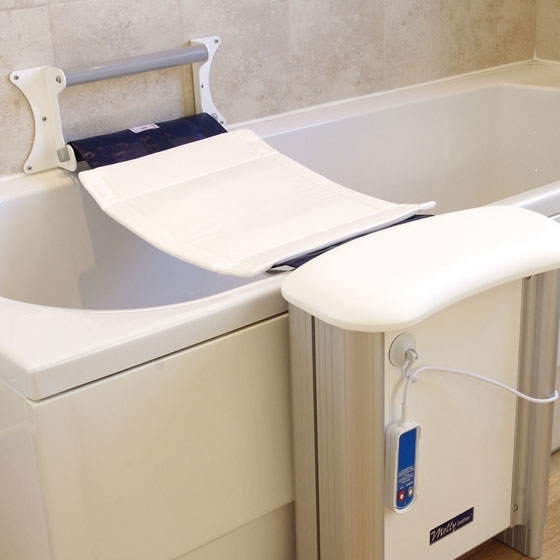 The bath lift is crafted from satin aluminium and stainless steel, designed to last for many trouble-free years.It allows you to use all of the length, width and depth of your existing bath tub. 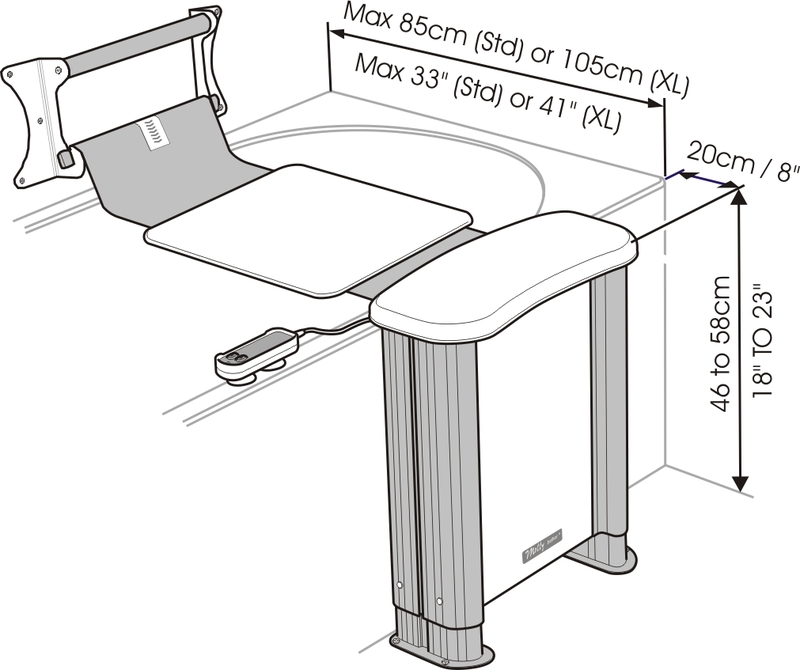 The unique slip cushion which has been developed which allows the user to stay central on the belt. The padded cushion uses a special closed cell foam, therefore any liquid is repelled. It is also machine washable. 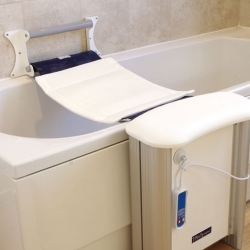 Extender grab bar which provides additional support and can be fitted left or right handed. Please note that the grab bar featured in the video has now been replaced with the one shown in the main picture. bath lift fitted very well and in use. As I mentioned the studs were in the wrong place and I had to install with one between the two side plates. I had a 9” wide board on the other side of the stud wall [ in the bedroom] and cut threaded studding 5” with nuts to fix. However managed to crack two tiles above bath. because of need to get nuts tight. Would suggest in similar situation that there ought to be a plate available, predrilled to take the two side plates, that was strong enough not to flex, possibly by having the top and bottom edges upturned. [about 1/8 should be enough] and then not be proud of the plates. that would mean that any flexing would be on the other side of the stud wall.